Valentino Rossi may have been unable to score, but the fans in Mugello were treated to a do or die duel between Lorenzo and Marquez. For the first time since 2008, Valentino Rossi (Movistar Yamaha MotoGP) lined up for the Gran Premio d’Italia TIM in pole. 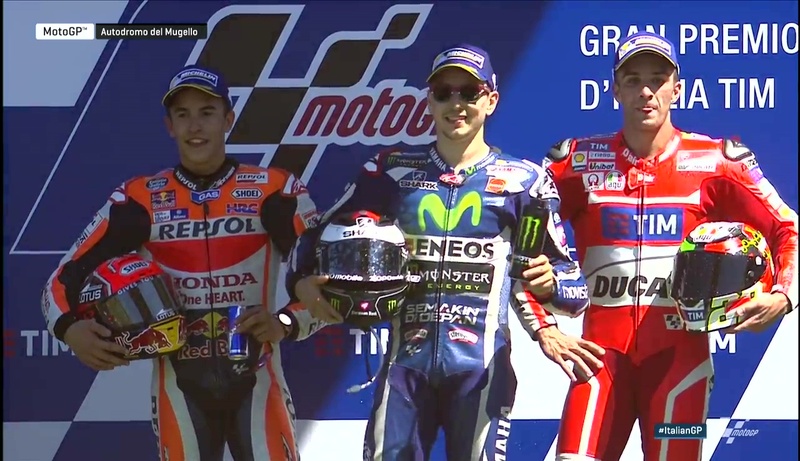 The last time he started from pole in Mugello he won, having not returned to the top step of the podium since 2008. Over 100,000 people lined the hillside stands of Mugello to see if ‘The Doctor’ could win once more. 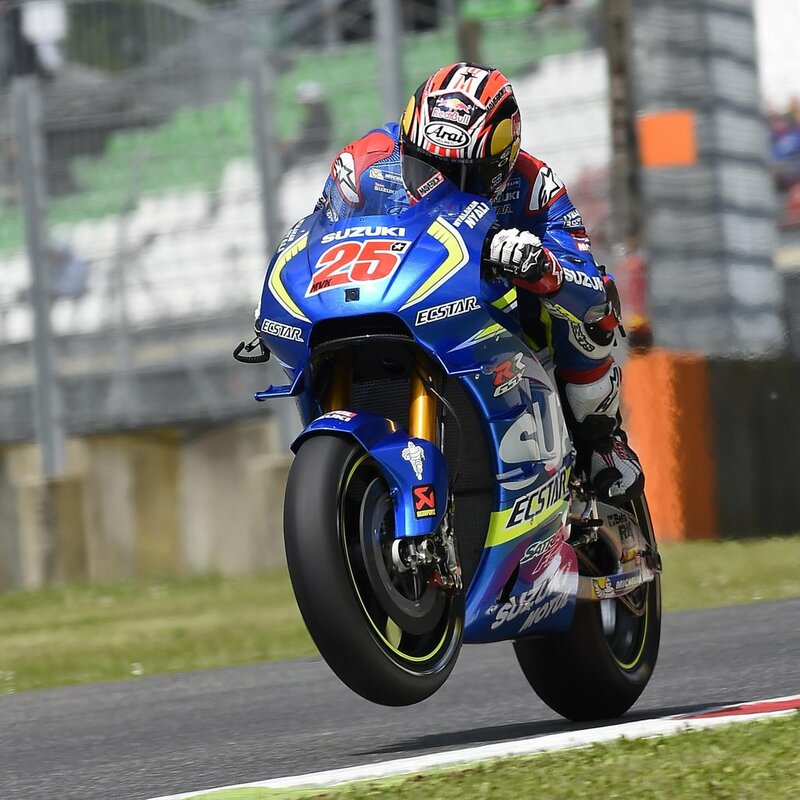 But it wasn’t going to be easy with Maverick Viñales (Team Suzuki Ecstar) and Andrea Iannone (Ducati Team) right alongside him on the front row. Riders filtered through clouds of yellow smoke on their warm up lap, getting a final pre-race taste of what the Mugello circuit was like. There was little time to think as the lights went out, Jorge Lorenzo (Movistar Yamaha MotoGP) making an incredible start to lead into Turn 1 from fifth on the grid. It was a disastrous start for Viñales who dropped down to 11th. Jack Miller (Estrella Galicia 0,0 Marc VDS), Alvaro Bautista (Aprilia Racing Team Gresini) and Loris Baz (Avintia Racing) all came together at the first corner and fell. The trio retired from the race, Baz heading to the medical centre for checks. Every lap Rossi attempted to pass Lorenzo into Turn 1, but Lorenzo remained in charge thanks to his incredible performance under braking. Their battle had allowed Marc Marquez (Repsol Honda Team) to close down the Yamaha pair, the trio separated by under half a second. Lorenzo closed every door that Rossi tried to open, defending at every corner. Further down the field Iannone and Viñales recovered from their poor starts as they blasted past Scott Redding (Octo Pramac Yakhnich) down the end of the straight to move into seventh and eighth. 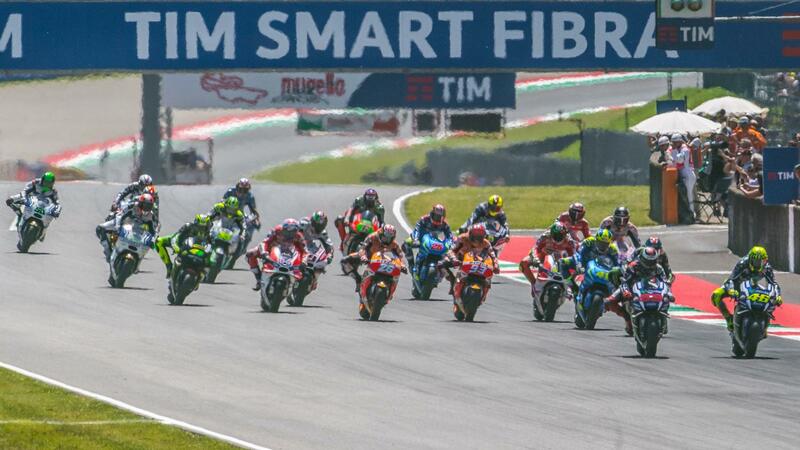 On lap eight Mugello fell silent as Rossi encountered a technical problem. The Italian dropped down to ninth and continued to drop back, his race over. His head hung low as he pulled off to the side of the track and returned to the pits on a scooter. The fans were silent as their hero trudged into the pits, hardly lifting his visor. Soon after Redding also retired from the race due to a technical issue. Rossi may have retired but the race was by no means over, Marquez right behind Lorenzo as they crossed mid-race distance. 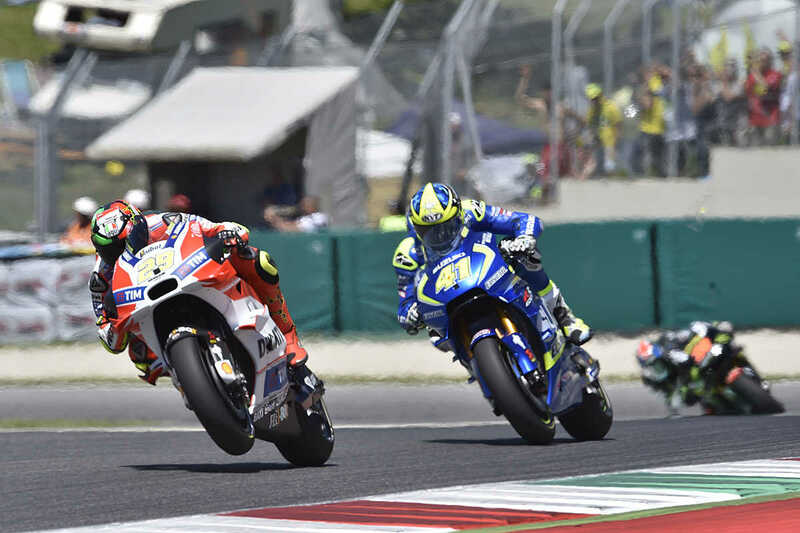 Their battle wasn’t the only one as Iannone’s comeback from a poor start continued, finding himself behind his teammate and battling for third. Iannone would eventually gain the upper hand, moving to third on the 17th lap but Dovizioso responded soon after, all the while Dani Pedrosa (Repsol Honda Team) closed in. A mistake from Dovizioso ended his chances of a podium. On lap 20 Marquez launched his first attack but ran wide, Lorenzo hanging onto the lead. The attacks didn’t stop and Marquez passed Lorenzo at the start of the final lap but Lorenzo responded again. Marquez looked to have the race won as they exited the final corner but his front wheel lifted ever so slightly, Lorenzo able to grab an incredible photo finish victory. 0.019s is all that separated them across the line, the closest finish of the year. Pedrosa and Iannone’s battle also went down to the final lap with Iannone able to win out by 0.168s and return to the podium once again. Seventh place saw Bradley Smith (Monster Yamaha Tech 3) finish as the top Independent Team rider. Lorenzo leaves Mugello with a ten point lead over Marc Marquez in the World Championship standings, Rossi holding onto third overall but now 37 points behind his teammate. During the race Andrea Iannone hit 354.9km/h, setting a new top speed record in the MotoGP™ World Championship. The Italian GP was a race full of potential for Valentino Rossi but one that eventually ended in a puff of smoke and disappointment. 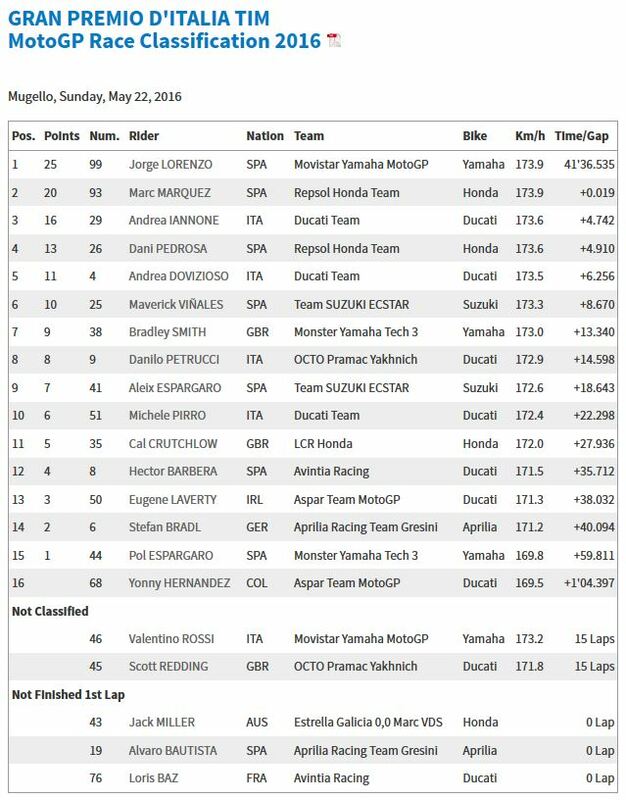 For the first time since he last took victory in Mugello, Valentino Rossi started the Gran Premio D’Italia TIM on pole position and had shown a threatening race pace during Free Practice 4. His Movistar Yamaha MotoGP teammate Jorge Lorenzo made a stronger start as the lights went out but Rossi was right with him. ‘The Doctor’ waited patiently, sniffing up the inside at Turn 1 but unable to quite overcome Lorenzo on the brakes. 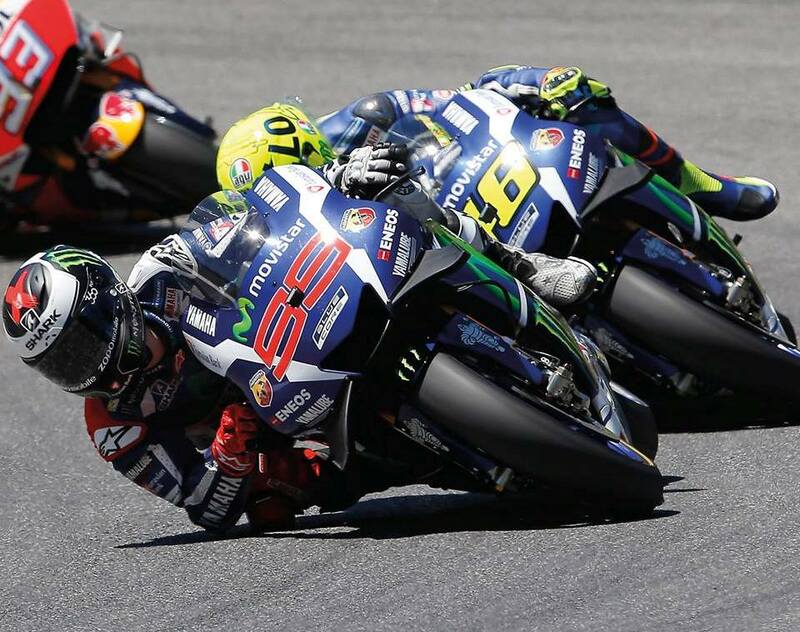 As the laps went on his attacks became more frequent, forcing Lorenzo to change his lines to more defensive ones. Rossi looked to be getting stronger and stronger as the race went on until lap eight when his M1 began to spew smoke. With a shaking head he pulled off to the side of the track and retired from his home race. Mugello was silent as Rossi made his way back to the pits. Failing to score sees Lorenzo open up a 37-point gap in the championship table, a sizeable gap. This is Rossi’s second DNF of the year, his first season with more than a single DNF since 2011. It’s onwards and upwards to Barcelona for Rossi as he looks to get his championship challenge back on track.